The past 20 years have seen a global regulatory focus on reducing vehicle emissions, specifically for CO2, NOx, hydrocarbons and particulate matter initially outlined in the Kyoto Protocol. Across the EU, this is reflected in Regulation EC443/2009 and addendums and in the United States by the EPA in its Emission Standards for Light Duty Vehicles and Trucks. The threat of penalties for failing to achieve mandated emission limits in both domestic and export markets has led OEMs to focus research efforts on emissions reduction as an integral part of new model and platform development. The commercial viability of both approaches depends among others on reducing vehicle weight to optimise the distance travelled per unit of fuel/power. The objective is to reduce emissions from petrol- or diesel-powered vehicles as well as to increase range per charge for electric-powered vehicles. According to Research by the Vehicle Technology Office (VTO) of the U.S. Department of Energy’s Office of Energy Efficiency and Renewable Energy (EERE), a 10% reduction in vehicle weight can result in a 6%-8% fuel economy improvement. Replacing cast iron and traditional steel components with lightweight materials such as high-strength steel, magnesium (Mg) alloys, aluminum (Al) alloys, carbon fiber and polymer composites can directly reduce the weight of a vehicle’s body and chassis by up to 50% and thereby reduce a vehicle’s fuel/power consumption. While there is growing adoption of lightweight materials in road vehicles, vehicle lightweighting is not a simple case of replacing one material with another. OEMs are already taking into consideration lightweighting potential with each new model generation and materials are a key element of component and system design. OEMs are now focused on anticipating future emission regulations by further exploiting lightweighting potential through designs and solutions that reduce or eliminate specific component applications and consequently the associated material consumption in these applications. 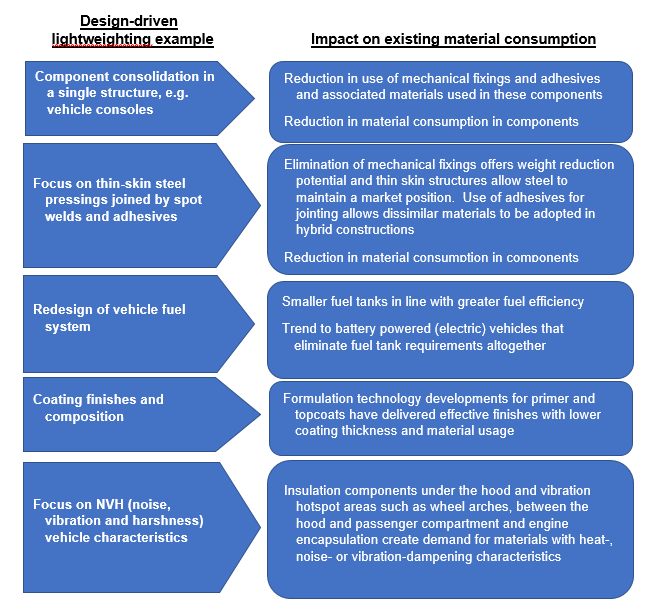 The above examples are a snapshot of multiple design factors that can be considered in response to emissions regulations and efforts to reduce vehicle weight and serve to illustrate the multiple influencers on material selection. In reality OEMs and suppliers are working on a component basis, resulting in multiple lightweighting options being selected for each vehicle. There is both the risk (for current material suppliers) of material reduction in vehicles and the opportunity for both material substitution in existing applications and adoption in new applications. 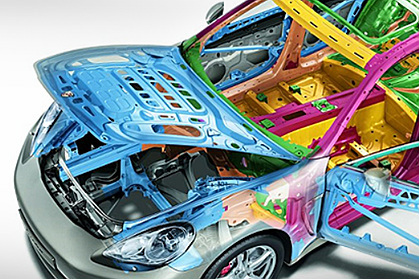 The drive towards lightweighting of vehicles while maintaining or even improving performance creates opportunities for penetration by lighter weight materials. The BMW i3 was launched in Germany in May 2014 and was lauded as the first zero-emissions mass-produced passenger car by a mainstream automotive OEM. Aside from its electric powertrain, it was the first volume production vehicle featuring a lightweight carbon fiber-reinforced polymer body that could achieve a range of 130-160 km on a single charge (22 kWh battery under latest New European Driving Cycle (NEDC) conditions). In 2016, BMW launched its 2017 i3 model upgrade. It has retained its carbon fiber-reinforced polymer body but increased battery capacity to 33 kWh and incorporated a range extender option. In 2016 BMW announced that by 2022 it expects most, if not all, of its passenger vehicles to be electric-powered with a range extender to maximize miles travelled on a single charge. The 2022 i3 model is already at the design stage. BMW is considering moving from carbon-fiber-reinforced composites to aluminum due to shortage of carbon fiber and its high price. BMW is already working on designs for its complete range spectrum with specific focus on lightweighting. Composites are expected to maintain a position in the vehicle especially in structural areas such as roof pillars and sills supported by high-strength, thin-skin steel and cast/extruded aluminum in vehicle construction. SAI, an international business consulting firm, has supported its clients for over 40 years with business intelligence services globally across the materials industry and automotive value chain providing insight and decision support. Founded in 1977, SAI is a knowledge-led international consulting firm with over 375 employees in 13 operations worldwide.